Hanoi (VNA) – The Vietnam Red Cross, on August 4, approved an urgent aid worth over 1 billion VND (43,990 USD) for provinces in the northern mountainous region, which is bearing the brunt of severe flooding. The target provinces are Yen Bai, Son La and Lai Chau. The sum is set to assist families of nine people killed during the storm and 224 households, whose houses were collapsed or swept away by flood, with 3 million VND (132 USD) each. It will also be used to cover the expense of 280 canvas sheets to make temporary shelters for displaced people, 150 house repair kits and 280 household supply boxes. Earlier, on August 3, the Yen Bai red cross officials sent a delegation to Mu Cang Chai district to deliver 27 million VND (1,187 USD) and nine emergency boxes for local residents. 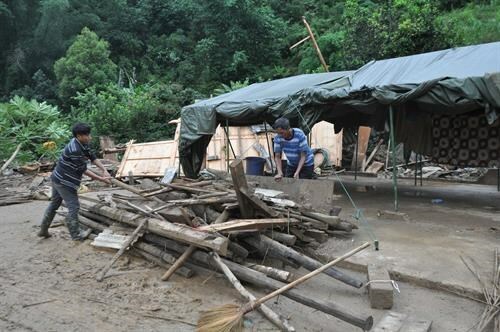 An official report showed that flooding in Lai Chau, Dien Bien, Yen Bai, Son La and Cao Bang from August 1 to 3 had caused damage exceeding 538 billion VND (23.66 million USD).